Familiar with the agile manifesto and agile principles. Several years of experience in agile project management (primarily Scrum), as well as in hybrid project management are what sets us apart. 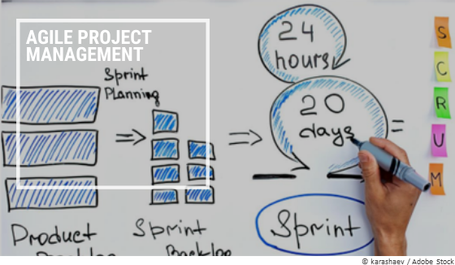 In agile project management, we focus on the project management office area. Above all, the PMO, as a central interface, has a leading role in the introduction and implementation of agile methods. The PMO promotes the understanding, acceptance, and application of agile methods. Introduction of JIRA/CONFLUENCE in the company. Coordination of the work packages and the effort with contacts from the respective teams should be taken over. Responsibilities for the individual work packages should be transparent should be easier to plan and control. Cross-team coordination for the project and central contact for JIRA tickets. The project particularly includes project calculation, stakeholder management, Atlassian license management, and regular reporting to the management.